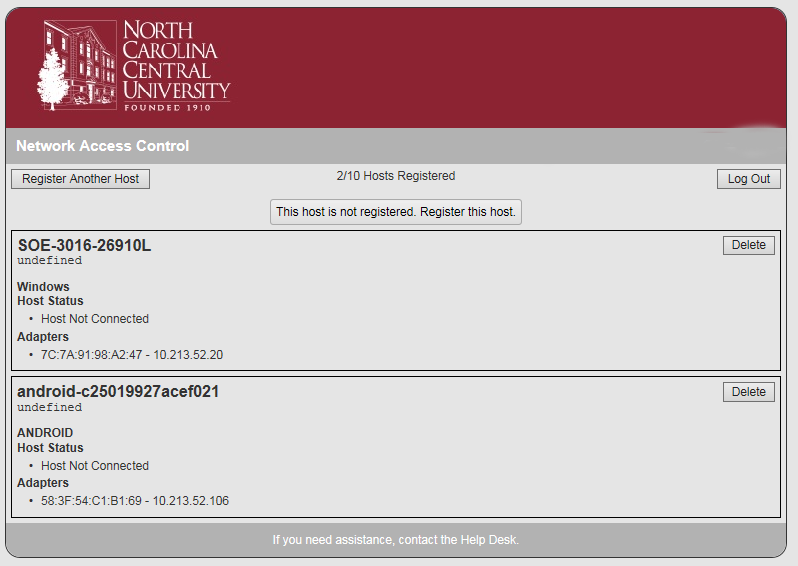 Faculty, staff, and students may register up to 6 devices for access to NCCU's network (wired and wireless). In the event that a user reaches their registration limit, it will be necessary to remove devices before another may be registered. The following steps provide access to removing devices from the network. From a device that is currently connected to NCCU's network, access the following link. The page below will appear. 2. Logon using your MyEOL Username and Password. 3. The following screen will appear displaying the total number of devices registered. It will also display whether a device is currently connected to the network to assist in removing the correct one. Check out this knowledge base article I found in the North Carolina Central University knowledge base. https://nccu.teamdynamix.com/TDClient/KB/ArticleDet?ID=15230 Remove Devices This article assists with removing devices from NCCU's network.